An edition of La Mort D’Arthur published in 1816.Bangor University is celebrating Arthurian Studies at the University by holding a public lecture and exhibition of rare books focusing on this area of study. Both events mark a donation by Flintshire County Council of a major Arthurian book collection to Bangor University Library and Archives. The lecture, 'Arthur: the King that Never Left Us' takes place in Lecture Room 2 in the Main University building at 5.00 pm on Thursday 16 April. All are welcome to attend the lecture. Complementing the lecture, the exhibition will be on display in the Council Chamber corridor in the University’s Main Building, areas which are open to the public. The exhibition will be available during opening hours from 13 to 27 April 2015. A renowned academic specialising in post-medieval Arthurian studies, Dr Roger Simpson, who will deliver the public lecture, has published two books on the Arthurian stories, Camelot Regained, and Radio Camelot. Throughout his career and publications Dr Simpson has highlighted how the Arthurian legend has provided an inspiration for literature and cultural events during the last few centuries. Book illustrator Arthur Rackham was popular during the early 20th century.The exhibition, curated by Bangor’s specialist in Arthurian literature, Dr Raluca Radulescu, brings together rare books from the newly acquired Flintshire Harries Arthurian collection and Bangor's own rare books and archives collection. The items on display from each collection complement each other and provide a fascinating picture of the development of the Arthurian legend through the centuries. 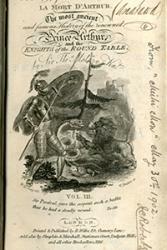 Included are rare editions of Gildas's De excidio Britanniae (The Ruin of Britain), the first text in which the battle of Mount Badon, at which Arthur was victorious against the Saxons, is mentioned, as well as examples of rare editions of Thomas Malory's bestselling romance Le Morte Darthur, such as the 1634 William Stansby edition (from Bangor's collection) and the 1933 reprint of Wynkyn de Worde's 1498 edition (from the Flintshire Harries collection). 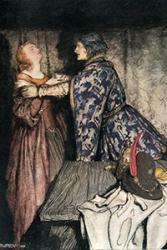 The exhibition also takes the viewer through the Victorian revival, with some splendid examples of deluxe editions of Alfred, Lord Tennyson's Idylls of the King illustrated by Gustave Doré and a selection of editions of Charlotte Guest's translations of the Mabinogion.